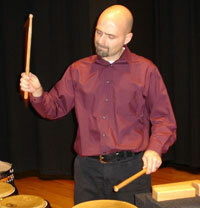 Dr. Chad Floyd is a percussion artist, educator, and composer. Chad currently serves as Associate Professor of Percussion at Campbellsville University where he instructs applied percussion and directs the percussion ensemble, steel band, and drumline. He also serves as Director of Steel Appeal, a steel drum academy based in central Kentucky comprised of over 100 students from the surrounding area. In addition, Chad serves as President for the Kentucky Chapter of the Percussive Arts Society and as a member of the PAS Education Committee. Chad has a diverse performance background in a variety of musical settings. He has performed throughout the United States, Brazil, China, Ecuador, Japan, South Korea, and Trinidad. He has performed multiple international tours as drummer for the Brazilian-based group, Almedia Duo, has served as drummer for the award winning band, Stoik Oak, and served as drummer for the Grammy-nominated members of Sojourn Fare. He has also performed with the Birdsong Steel Orchestra at Panorama in Trinidad, and with the Lexington Philharmonic Orchestra, Orchestra Kentucky, Sacred Winds Ensemble, and Bowling Green Chamber Orchestra. Chad’s original compositions and arrangements for percussion are published by Bachovich Publications, C-Alan Publications, Innovative Percussion Inc., Row-Loff Productions, and Tapspace Publications. He is a contributing author to Percussive Notes, Bluegrass Music News, and Tempo, and is also an active member of the Percussive Arts Society, National Association for Music Education, and the Kentucky Music Educators Association. He has directed high school and collegiate percussion ensembles to multiple performances at the Kentucky Music Educators Association Conference, a WGI Indoor Percussion World Finals placement, and has directed multiple performances with several internationally renowned percussion artists. Chad holds degrees from the University of Kentucky (DMA), Belmont University (MM), Eastern Kentucky University (MAED), and Campbellsville University (BME). He has studied primarily under James Campbell, David A. Johnson, and Todd London. Chad Floyd is proud to be an artist endorser/clinician for Grover Pro Percussion Inc., Humes and Berg Co., Innovative Percussion Inc., Pearl Drums and Adams Musical Instruments, and Remo Inc.
IP artist Dr. Chad Floyd presents a tutorial and performance of the 2015 Kentucky All-State Keyboard Audition Etude, which he composed for this year's audition! Chad Floyd, associate professor of music and director of percussion studies at Campbellsville University in Kentucky, performed a tour of South Korea as drummer for the Brazilian based group Almeida Duo in June of 2014. The members of the duo are Saulo DeAlmeida (cello, basses, piano) and Dennis Santos (flutes, saxophone, piano). In addition to Floyd, the duo was accompanied by Bill Budai (piano) and Wansoo Cho (violin).